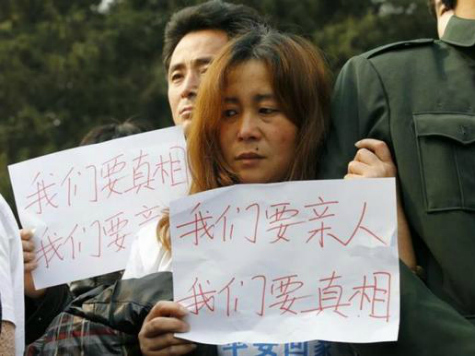 The relatives of those on board missing Malaysia Airlines Flight 370 have taken to the streets of Beijing to protest the lack of new evidence pointing to the government’s conclusion that the flight crashed into the southeastern Indian Ocean, leaving no survivors. Malaysian authorities announced Monday that satellite evidence indicated that the plane had headed down what they called the “southern corridor” – a path far south of its destination, Beijing – and crashed into waters 1,500 miles west of Perth, Australia. ‘Pings’ to a British satellite system identified the plane, according to acting transportation minister Hishammuddin Hussein, and while no search groups have found any debris from the plane in person, satellite footage from China and Australia led investigators to conclude “without a reasonable doubt” that the plane had crashed. The relationship between China and Malaysia – and, specifically, between Malaysian authorities and the Chinese relatives of those on board Flight 370 – has been strained since the plane disappeared. Those stationed in Kuala Lumpur threatened to begin a hunger strike if not given more specific information on the plane’s disappearance, and reporters found Malaysian officials barring them from speaking with the relatives in Kuala Lumpur International Airport. The Chinese government, meanwhile, is calling for Malaysia to hand over the specific evidence from British satellite system Inmarsat that they claim shows the plane ‘pinging’ for about eight hours before losing contact at the suspected crash site, about the time the plane would have run out of fuel. Chinese President Xi Jinping deployed Vice Foreign Minister Zhang Yesui to Kuala Lumpur to pressure the government there to share the satellite information, as many of those involved in the search and rescue operations are Chinese. According to the Associated Press, the Malaysian government is not promising to find the plane anytime soon, as the area in which they are looking has only been narrowed down from the size of Australia to the size of Texas and Oklahoma combined.